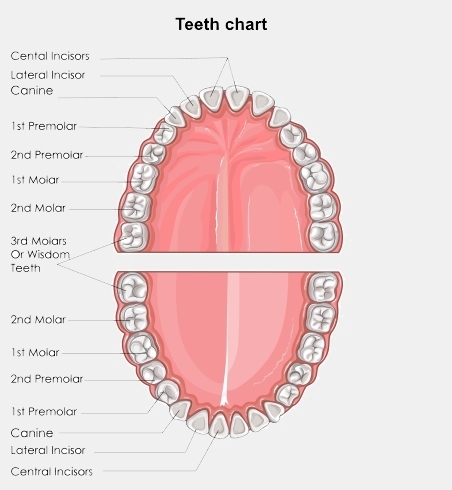 We have two sets of teeth in our lifetime, 20 primary or baby teeth and 32 permanent or adult teeth. Baby teeth start to appear at around 6 months of age and grow in stages until around 3 years of age. These teeth start appearing to make room for adult teeth between the ages of 6 and 12. Your adult teeth will generally have all come through by around 21 years of age. Our teeth come in different shapes. Incisors at the front are for biting into food. Canines are sharp and allow us to tear food. Premolars sit in front of the molars, which are the large teeth at the back made for chewing and grinding food. The last teeth to grow are your wisdom teeth. It's important to look after your teeth all the way through your life. Not only do healthy teeth make beautiful smiles, good oral health prevents pain, expense, and has a positive effect on your overall health. You can look after your teeth and gums by brushing your teeth morning and night. Use a soft toothbrush and fluoride toothpaste. Swish and spit but don’t rinse. See Looking after your teeth and gums for more information about looking after your teeth.